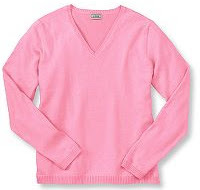 I have this pink v-neck sweater that I bought a little while ago. I tried it on and I liked the color of pink. But I kind of looked like a grandma. What colors can I wear with this for pants, skirts, underneath and shoes in a trendy way? Wear it with dark pants, long or short, and high heels, for a casual but also well put-together look. Layer it with a white tank top and wear it with jeans. Jeans can be dark or light. On your feet, depending on how casual you want to be, you can wear sneakers, ankle boots, or high heels. For a more preppy look, wear it with a white shirt underneath it. Or, if you can find it, with a white shirt with thin pink stripes, or tiny pink dots. You can wear this with jeans as well. For a more elegant look, try the plain white shirt underneath with a pair of white pants. You can even copy this whole look and get a gold belt. At your feet, you can try a pair of gold flats. For something different, wear it with a dark blue denim mini skirt, and purple tights. 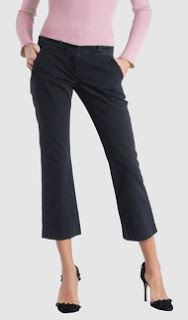 If you feel colorful, and you like to take risks, try wearing different color pants and shoes, like in this picture. Keep it in the yellow and blue tones. Or maybe try green and lavender. Finally, for the colder days, you can wear a cardigan sweater on top of it. I think pink and gray look great together! Good ideas!